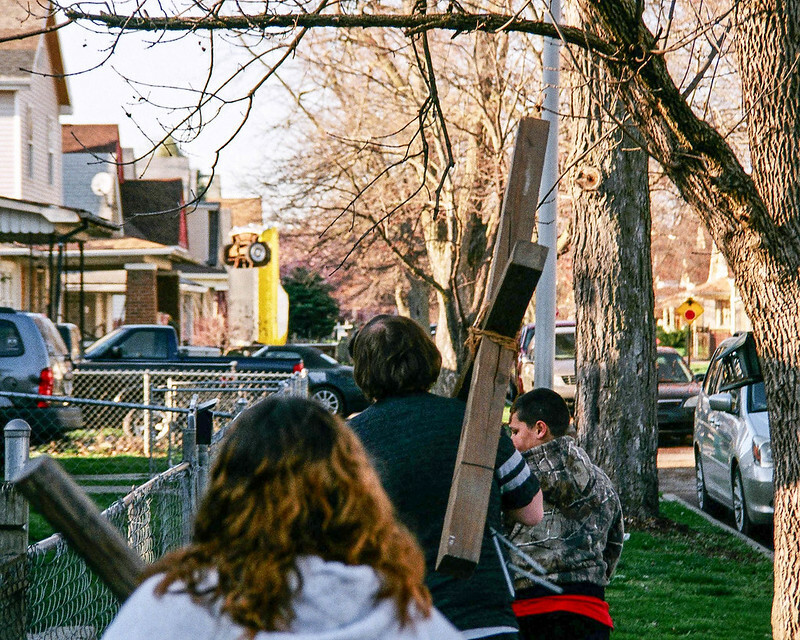 It’s a Good Friday tradition at West Park Christian Church, on Indianapolis’s Near Westside, to carry the cross through the neighborhood. 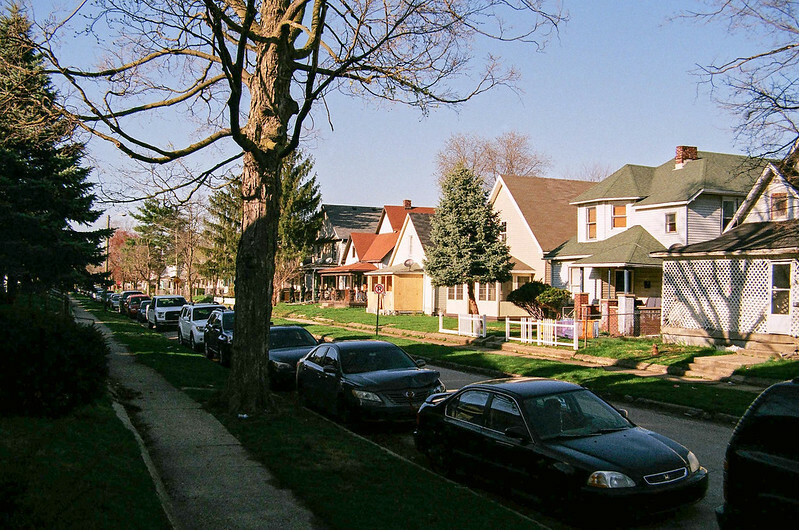 A hundred years ago, our brand-new neighborhood was a cheerful middle-class enclave. West Park Christian Church was new, too — and had hundreds of members. We have several panoramic photographs of our congregation through the 1910s and 1920s on our walls; see one of them here. But the neighborhood, and the church, began to decline in the 1950s. Today, the neighborhood knows too well the problems of poverty. 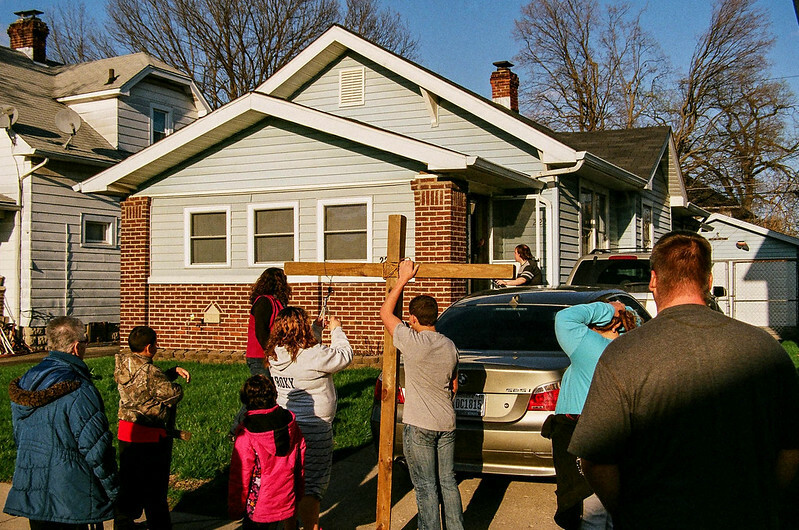 By the 1990s, most members had long since fled to the suburbs and drove back here for worship. When someone from the neighborhood visited, they found a congregation that didn’t look like them and they didn’t come back. By the early 2000s, attrition (mostly through death) brought us to fewer than 10 members and within inches of having to shut down permanently. 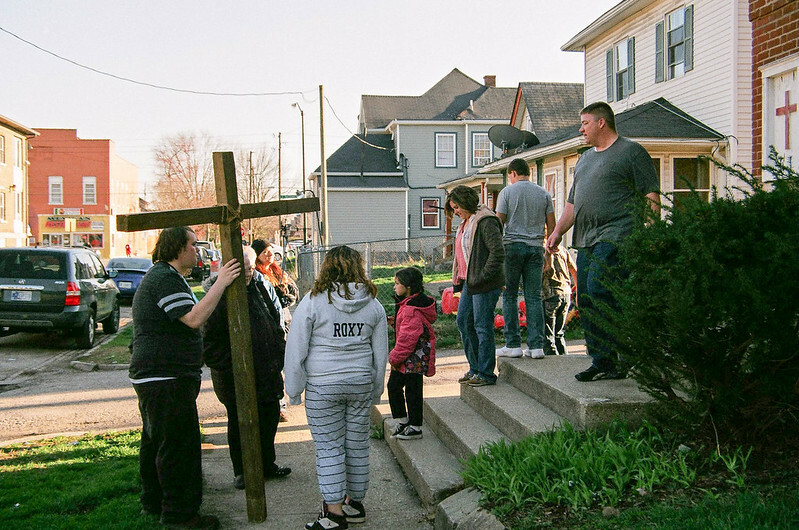 But a new pastor in 2004 refocused the church on the neighborhood, and we began to grow again. We do many things for the neighborhood: a food pantry, a clothing pantry, a well-attended Wednesday-night youth program, referrals to social services. We’re even trying to get a infant-and-toddler daycare off the ground. 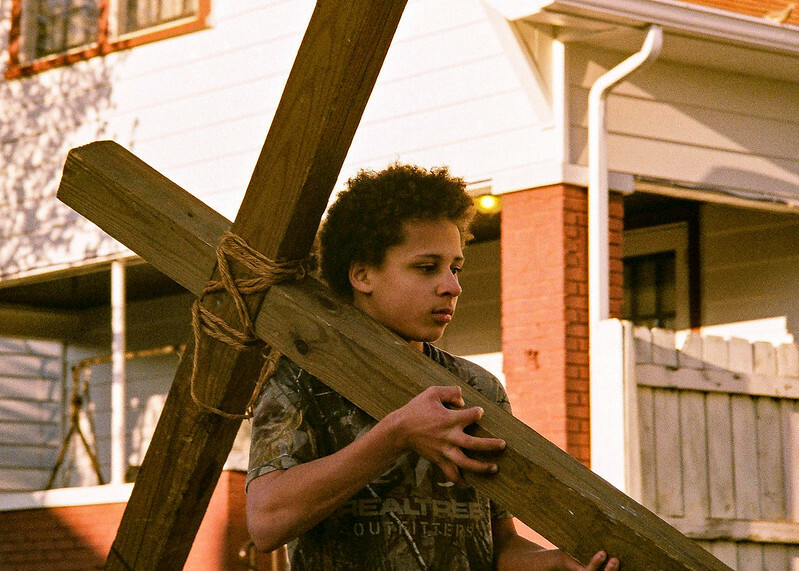 But on Good Friday, we still carry the cross. This year it was largely a youth effort. 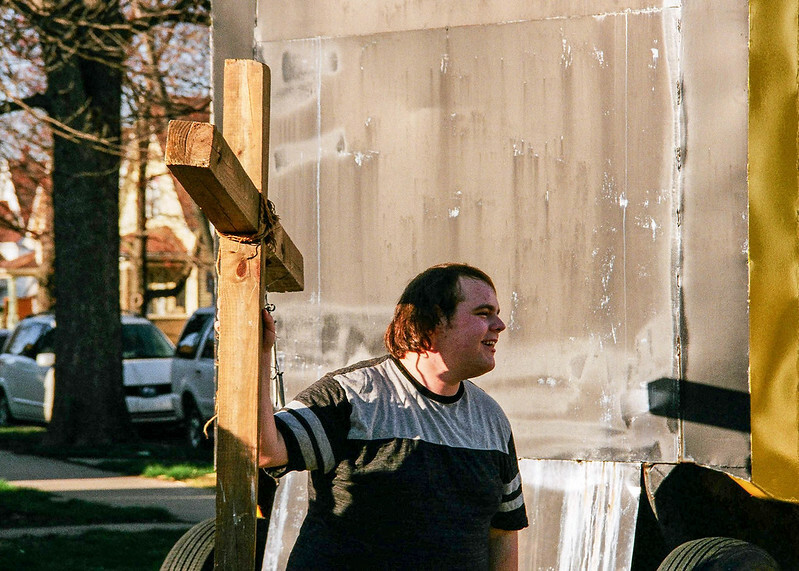 That’s Billy, carrying our large cross through the alley that runs by our building. He carried it for more than half the walk. The first place we stopped to pray was this pocket park in a formerly vacant lot. 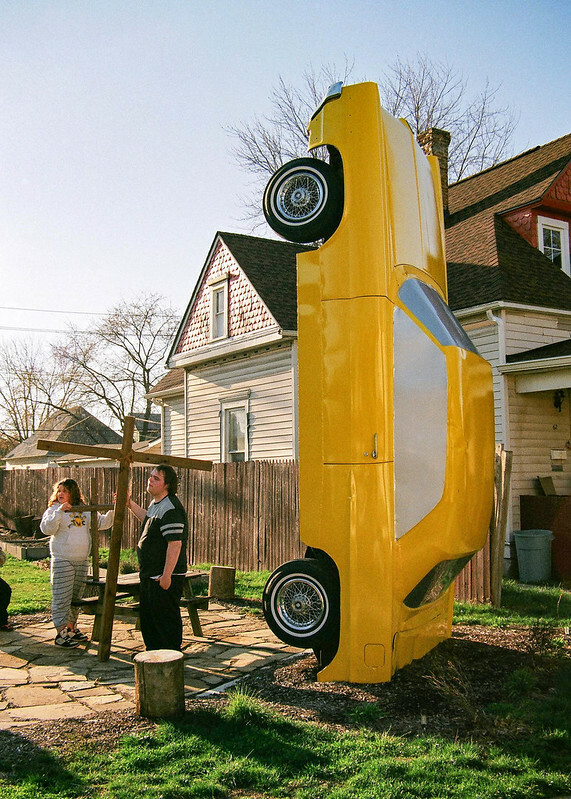 A neighborhood resident spearheaded the work to make it happen, including planting this old car into the ground. Billy was very pleased to carry the cross on this first leg of our walk. 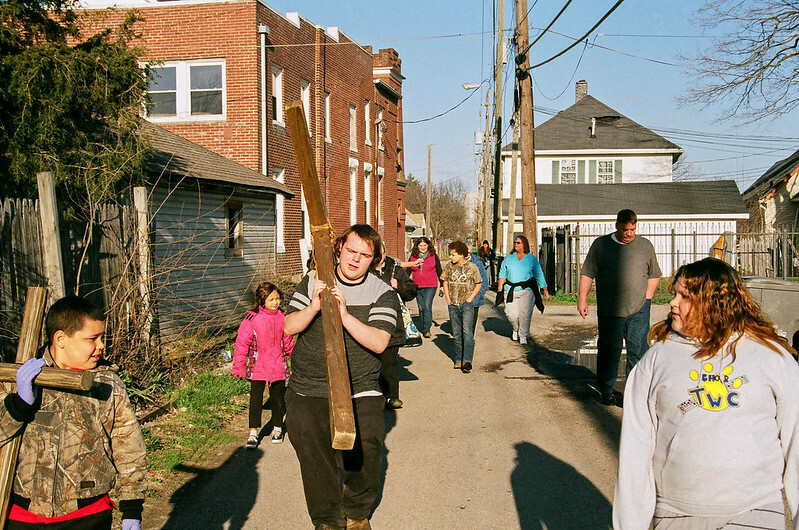 Rob, one of our youth pastors, carried the cross briefly after we left the pocket park. This was our crew, small but determined. We also stopped to pray at Hawthorne Center, the neighborhood’s community center. It’s another place of safety and stability in our turbulent neighborhood. 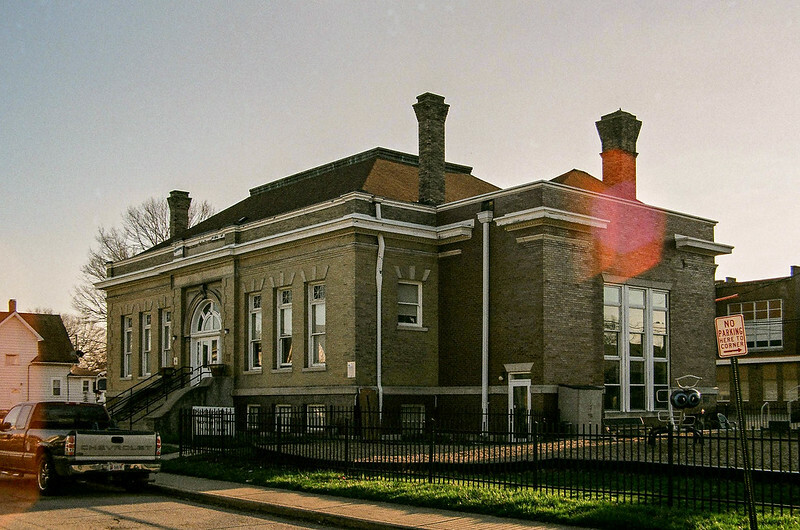 The building is a Carnegie library. Several of the younger children took turns carrying the cross. This is one of Rob’s sons. He’s far smaller than the cross, but he handled it well. Our last stop before returning to the church was at the home of two of our most elderly members, Leo and Marie, both in their 90s. Marie was the director of Hawthorne Center for many years, and now her daughter holds that role. Leo was in poor health this day and couldn’t come to the door. Marie didn’t feel great either, but did come to greet us. Sadly, Leo passed away a few days after we stopped by. I shot this with a Canon AE-1 Program that was recently donated to my film-camera collection. I already had one, but this one was in better condition. So I sold the other one and loaded some Fujicolor 200 into this one to test it. 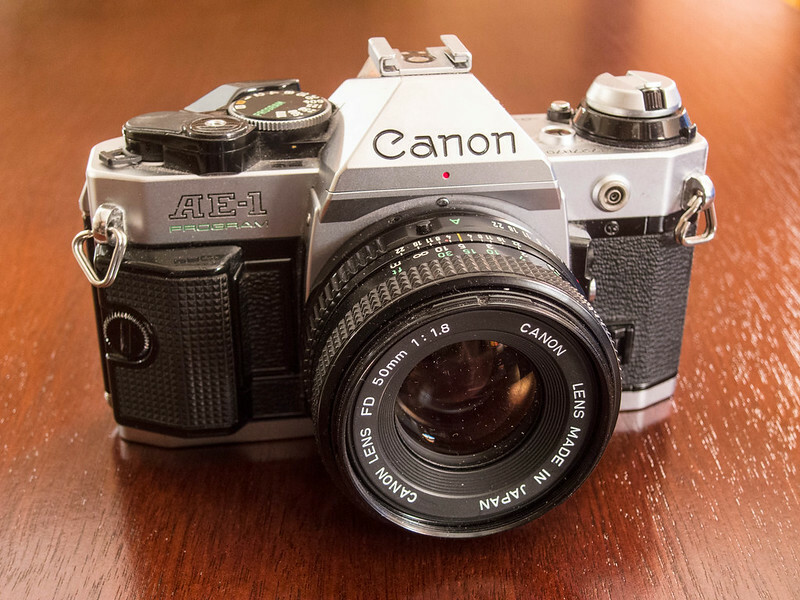 I planned to write a new review of this camera from that test roll. 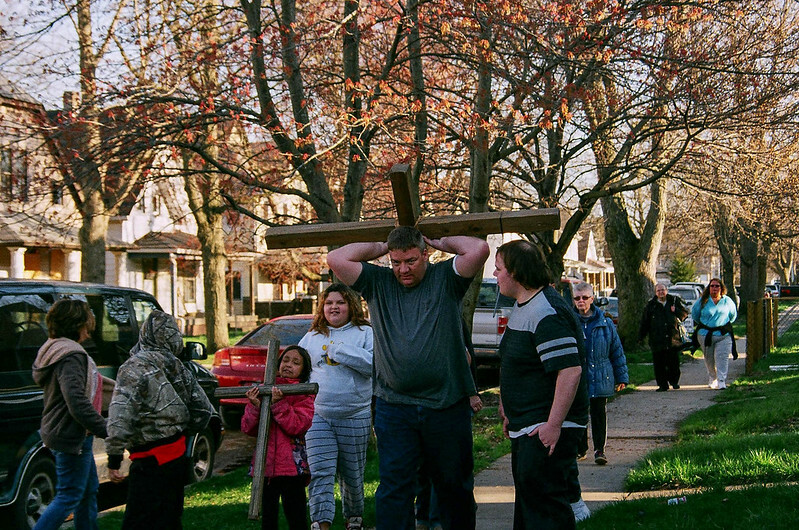 But when Good Friday came around, I’d only taken a couple photos on that roll. I decided to take a chance and use it to document our walk. Heightening the risk, I tried a lens I’d not used before: a 35-105mm f/3.2-4.0 Vivitar SMS zoom. I’ve owned it for so long I forget where it came from. I have had such mixed results with off-brand lenses, but this one handled very well. I figured I’d be fine when, on more than one occasion as I brought a subject into focus, I had that “ohhhhhh yes” feeling knowing I’d nailed it. A lens hood would probably have eliminated the flare I got when shooting into the low sun, but the effect is at least not displeasing. Thanks Chris! Our youth really look forward to this every year. What a great tradition to carry on. From what I understand, your congregation is unusual in its continuity at the same location. Didn’t most move to the suburbs with most of their members decades ago, selling their buildings to other congregations made of those moving into the area? 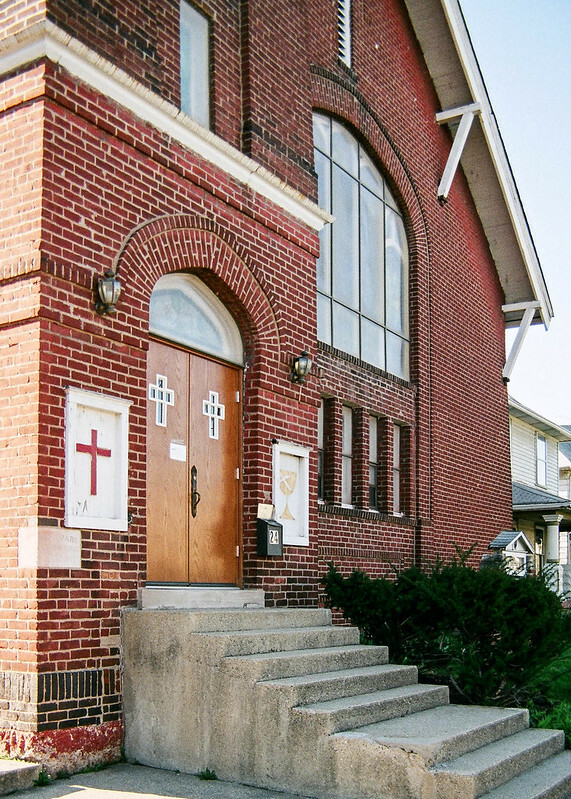 The old church in a declining neighborhood has long been a Catholic issue. It’s all the more impressive that you guys have done it alone. An argument can be made that we’re not the same congregation anymore. The link to our past is a small handful of members who stuck it out. Without them, we would have closed. Thanks Andy! This was a new experience for me — photographing moving people at an event, with a manual-focus SLR. And using a new-to-me lens yet! I’m thrilled the photos turned out. A great little photo story and I’m pleased to hear a good time was had by all. Those photos are really good – you did well with that old Canon. 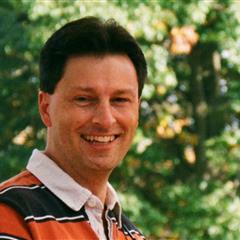 I enjoyed this blog post Jim. The photos really tell the story and I like that. Keep up the great photography man!